Animals are so wonderful to draw. You have captured that look in the eyes. Drawing on a daily basis soon becomes a part of who you are. I have been doing this since 2013. Like you I have a not so precious sketchbook where I feel I can play and experiment in. Sometimes this ends up being the sketchbook I take into coffee shops. Keep drawing, keep creating! You made a lovely drawing of Charlie! I love the eyes, and nose. Great details and the eyes have so much expression. Thank you, Deborah, for your visits and encouragement! Art is such a wonderful presence in all of our lives! Teresa, thanks so much! Not sure how much TV you watch, but I often draw my husband’s feet, my feet, or even something on the screen (like your Jeopardy contestants). Makes it easier to fit in that way, I find. So glad you enjoyed this and got something out of it. Those sketchbooks are great! Thanks, Rebecca! That paper doesn’t have as much tooth as my mixed media journal, and I love how easily I can blend on it. Another bonus! Glad you enjoyed this one, Charlie is a joy to draw! OH MY SWEEEET CHARLIE!!!!!!! His Aunty Loo captured him only like a special partner-in-crime Aunty could! 🙂 Oh Laura – you melted my heart with this drawing that captured him even better than a photo could. I can see right into his soul through the eyes you drew! This will be a forever treasure to me sweet friend! I am humbled and honored and Charlie is dancing with joy! You totally made my day! And Charlie’s! THANK YOU!!!!!!!!! Aw, yay, my work here is done! So glad you love it, Jodi! Wow, I have tons of sketches of Charlie, mostly from my blogging break last fall and winter. I became addicted to capturing him – he’s a terrific subject! Really glad you enjoyed this. This photo was so endearing……how can anyone resist??? ❤ I'm glad Charlie approves too. This is important! You certainly captured the expression in the dog’s eyes; waiting for someone to be his companion at the moment. I agree. Drawing is my favorite relaxing medium, adding objects into the story as go. Thank you so much! Yes, he looks like he’s waiting for a friend. 💜💛❤️ Drawing is so wonderful. And underrated IMO. Love this post. I am gonna have to start drawing. You make it sound so fun. That dog is cute. Yay, Dawn, so thrilled to hear this!!! Your shapes are amazing, I’d have thought you were already a regular drawer! Glad you enjoyed this! Yay, sounds awesome! I love pigs! I can’t draw too well from imagination though. Abstracts are different, that’s all from my head but realism, I need a reference. Do you have pigs lol? No pigs. Just dogs, chickens, turtle and fish. I’ve painted a few pigs before though so it is a quick scribble. I just love their little faces. Snouts are so the best lol. They are so cute…I wanna poke their nose holes! And yay for chickens! Must be fun! Chickens are very cool and smarter than people give them credit for and can be pretty attached to you. Some of mine like to sit on my lap which is fine,but they are little hot boxes so it gets really hot. Gracie will sit there for 1/2 hour unless I scoot her off, then she gives me lip…bwaaaaaak! Sasha just looks at me like I’m a mean ol witch. She just stares and then walks off. Nug Nug gets down and goes and does her own thing. Shelley and bunny are more flighty. They don’t sit with me and hoops, wiggles and peanut didn’t come to me till they were 5 weeks old so they just like me for sunflower seeds. ❤ have you ever tried to draw/paint them? Thanks so much, Rebecca. If I could only paint them as you do, my friend! I’m better with pointy mediums lol. Thanks so much for your kind encouragement. Thank you so much. I would like to paint them, not just draw them tho. I feel like a representational drawer and abstract painter. Feels like a strange combo! I will put this on my list and thanks for your kind advice Rebecca! Of course, you know I agree with everything you’ve said. I don’t have any talent. I didn’t think I had the right to buy art supplies because I wasn’t an artist. I thought trying to learn to draw would be a complete waste of time. But, like you, I’ve seen what can happen when we practice daily. I cherish my sketchbooks, and yes, dating your drawings turns a sketchbook into a visual journal of life. I love your Charlie drawing. It’s excellent. Thanks for a very inspiring post. Thank you Steven but I bet the first story you wrote wasn’t great. Or the first picture you took. Not sure why everyone thinks if they can’t draw at first try, it means they lack some mythical gift and the art fairy somehow missed their stocking. Sometime I’ll find my first bird drawings (from 8/14) and post them. And everyone will see I’m not gifted or talented with art. Truly. I think it’s true that very few are naturally gifted right from the start. I certainly wasn’t… it took years to develop a voice and find the confidence. The ratio between blah and good is quite high… thousands of pages of practice. But eventually, I found the confidence to call myself a real writer. And there’s ALWAYS room for improvement! If you love what you’re doing, and do it enough times, the latent talent shines through. That’s exactly it. There has to be passion behind it! I recognized Charlie right away! Thanks, Kathy! So glad to hear this! Bravo! Wonderful image of a loving friend! Hoping some of your talent rubs off on me as a friend has asked me to work on a pooch portrait…. Cheers! Frank, you will have no trouble at all! Thank you so much for your kind comment! I was showing this to Terry the Quilting Husband and he said it time you start drawing schnauzers – ha! But seriously we love the dog drawings! Yes I suffer a bit from schnauzer obsession! They are so beautiful! I can’t blame you! I love to draw dogs too. I’m sure Jodi is loving this sweet drawing of Charlie. Beautiful Laura, you capture his sweetness in his eyes. Thanks Jill! And yay for inspiration and encouraging friends! Charlie is a terrific subject. His eyes alone are enough. Glad you enjoyed and glad you encouraged me last April! Thanks, Kerfe. I was happy with this one. I never know how those sketches in that book will turn out – but it takes the pressure totally off, which helps a lot. CHARLIE!! awwwww!!! LOVE this! Such a beautiful drawing and I recognized him immediately, Laura!! 😍Really beautifully done! 💕💜(you are talented by the way! hehe). Yay to daily sketching! It really does make all the difference in the world. I’m heading toward my Day 365! (and then I guess I’m up for 31 more in July). Honestly, I don’t know if I’ll ever stop now. You never will, Charlie! A rolling stone gathers no moss, and your stone is rolling baby! Building speed and momentum all the time! Thanks for the encouragement, buddy. I wound up liking this one more than I thought I would when I first took up that foreshortened snout shot. hehe. I couldn’t resist those eyes!! 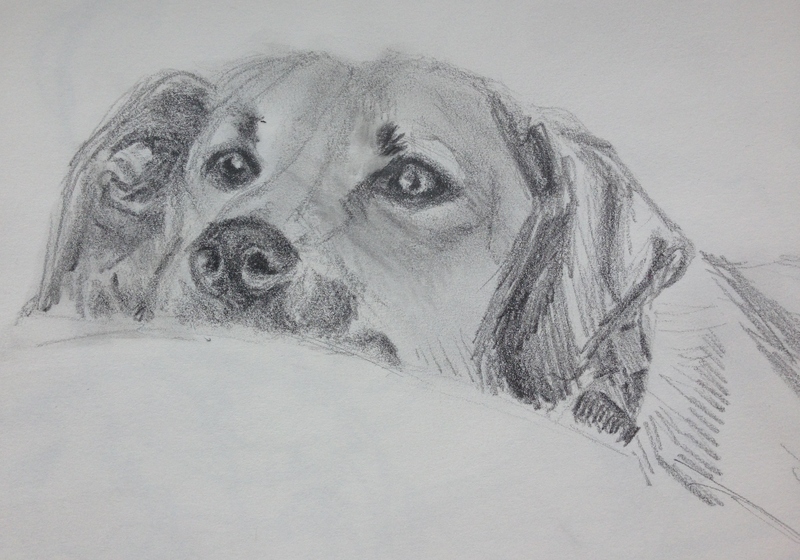 Magnificent sketch of Charlie, you really captured his lovely soulful eyes. Every word you posted is true, drawing everyday is very beneficial, for art, for body and for soul. Thank you for sharing your lovely sketch and putting a good word out there for making drawing a habit. Thank you, Haunani, for shining your light brightly as always in WP! Thanks, Jean! Couldn’t resist them! I’m laughing like a madman at how ridiculously adorable Charlie is – what a great dog ❤ Great sketch too Laura! The eyes are so full of life. Thanks, Jacob. I’m drawn to his eyes again and again! Thanks so much, Ann, so glad you enjoyed it. Love your comments about the glance, and you’re right. I haven’t owned a dog since I was a kid, but that is definitely the glance. Thanks again. Thanks, Susan! Just love Charlie! Thanks, Debi. I can’t resist his face; it calls me time and again. His eyes are just too much! Glad you enjoyed it! he is a magnetic, that dog!! He looks adorable, wonderful job! Thank you! I could not resist this pose. He is a doll! Thank you, Denis! I’m wondering what your first subject might be. Have a great night friend. I could have guessed. Hehe. Please do it! I would love that! Thanks, Myriam! Who can resist that Charlie face? I am trying to draw or paint everyday – the advice you read over and over, and i do enjoy it and see improvement! I am new though and have a question. I was drawing with a #2 pencil in a strathmore sketchbook. The drawing get smudged – how do you avoid that? Glad to hear it, Marieanne! For sketchbook work, I just skip the facing page, but you could also protect your work with a spray fixative. I believe it takes a couple of days for the fixative to cure, so you may want to keep that in mind. Let me know if you need anything else, and good luck to you! If you have a blog, I’d be glad to follow you. Sure, Neha, I’d love to see. Give me a link when you’ve got it posted, and I’ll check it out! I posted it in wordpress.